In Orton-Gillingham the silent e is introduced after the students have mastered short vowel sounds. When an e is added to the end of a short vowel sounding word, it changes the sound and also the meaning of the word. The silent e makes the vowel sound long and say its name. For example, rid becomes ride. 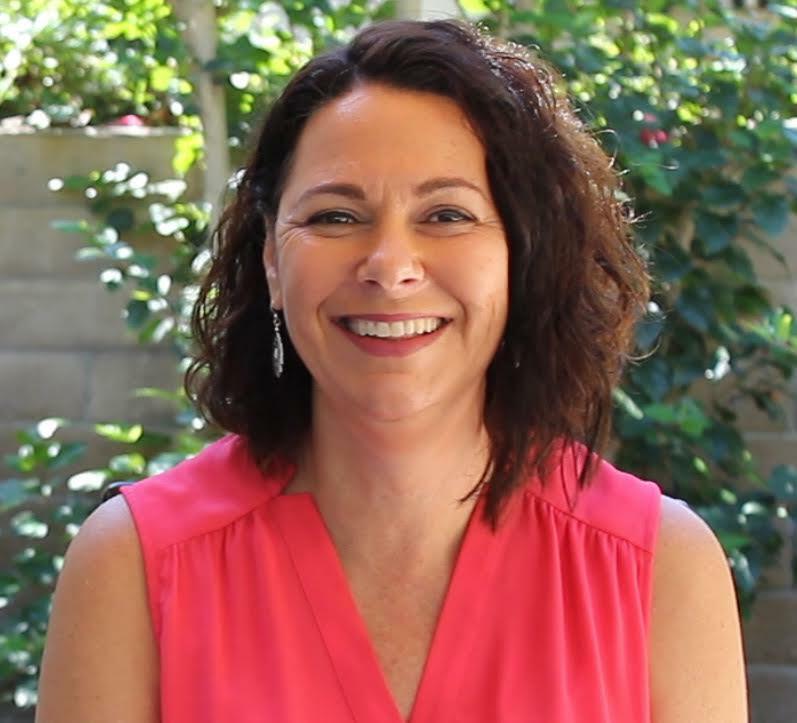 On today’s post I am going to give you a really great Orton-Gillingham activity that you can use to help your students learn the silent e as well as a list of words you can use to practice it. You only need 3 things for this Orton-Gillingham activity. Wood Stick shapes – you can buy these at Michaels or any other craft store. 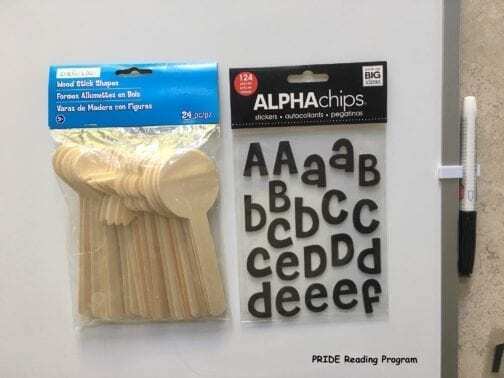 Letter Stickers – you can also buy these at Michaels or you can also just use a sharpie and write the letter on the wooden stick. Put the letter stickers (or write it with a sharpie) on the wooden stick. 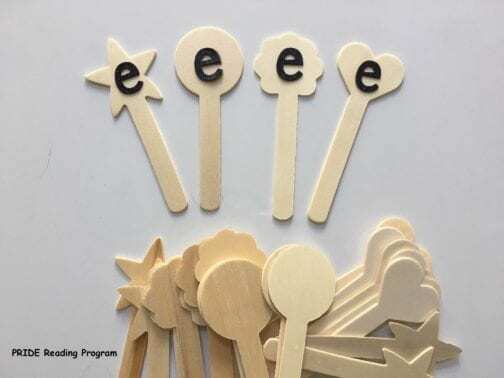 If you are teaching a group, you can make several of them so that each student has their own magic e wand to use. Write a list of short vowel words on the whiteboard. See the list below for suggestions of CVCe words. 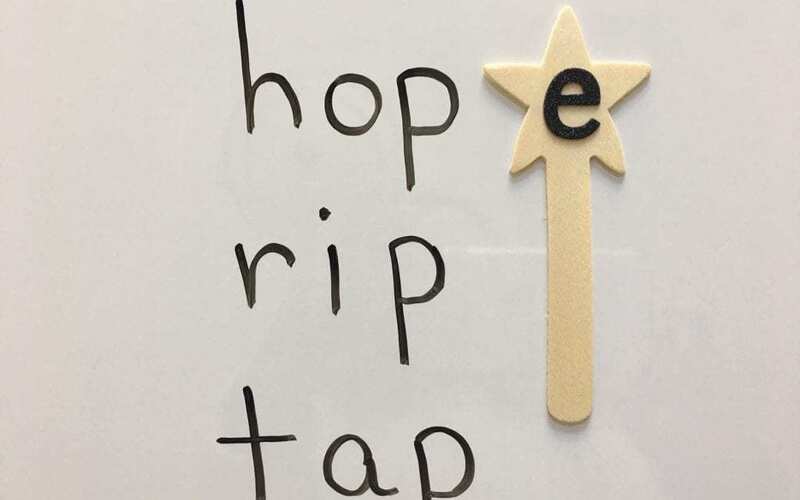 Students will simply read the CVC word and then place their magic e wand at the end of the word to change that vowel sound. When I teach this Orton-Gillingham activity in a group, I have a large basket filled with these wands of all shapes and the students can pick out what they want. You can also use this as a center activity with partners. If your child isn’t really 100% sure of all the short vowel sounds, then they might not be too successful with this Orton-Gillingham activity. To be able to learn magic e, your child must be very fluent reading short vowel cvc words (pot, hut, sit, cat, etc.). 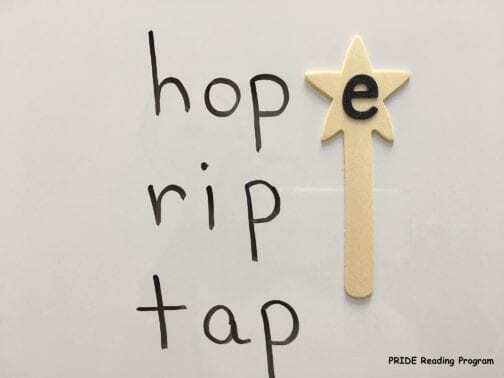 If your child doesn’t have this skill yet, you will need to back up and fill in the missing gaps before you teach long vowels. 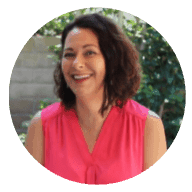 If you need a great Orton-Gillingham reading program that is easy to use and heavily scripted out, check out The PRIDE Reading Program. Let me know what you think. Thank you for reading my post today!